If you're like most digital camera users, you probably bought your first camera several years ago. Now your My Pictures folder is jam-packed with pictures of everyone you've met and every place you've been since you first bought the camera. And if you're like most digital camera users, that folder is probably a pile of unsorted or loosely sorted pictures, so finding one in the pile is almost impossible. Adebis Photo Sorter (free) can help... to a point. Adebis Photo Sorter lets you sort your photos and save them in separate folders. The free download makes it easy to pick a folder that's filled with unsorted photos, choose a destination folder where you want to sort your pile, then set up some date-driven parameters. Adebis Photo Sorter can search and find every photo you took in 2009 and put them all in a folder called 2009. And it gets more granular than that, sorting by season, month and even day . It will search a broad range of file types as well, including jpg, tiff, raw, and others. 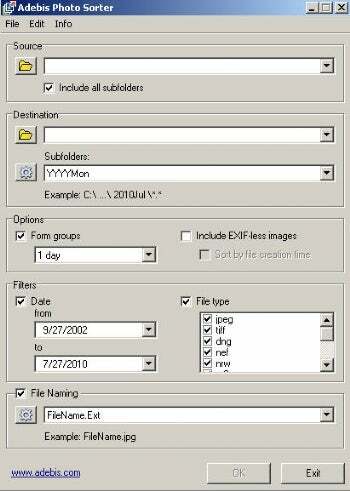 It only sorts by date, using EXIF data in the file, so if you already have a temporal sorting system it won't add much. But if you have a truly unsorted slush pile of photos, Adebis Photo Sorter is a quick and dirty way to sort it into some kind of order. And it would come in handy if you're looking for a particular shot that you remember taking during a particular time. It's a handy little app to have on hand.